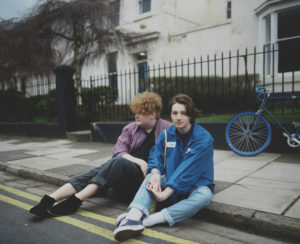 Tanto el noruego Audun Laading como el inglés Stephen Fitzpatrick proceden de unas tranquilas ciudades costeras, pero las circunstancias les juntaron en Liverpool, donde encontraron una conexión especial gracias a su sentido del humor y la pasión por el arte underground. Los últimos meses han sido un torbellino para ellos. La canción ‘Marcel’ sigue a sus singles de debut ‘Dorothy’ y ‘What Once was’, que contaron con el apoyo de Radio 1 y juntaron entre ellos casi medio millón de reproducciones. Después de sorprender en Kendal Calling y Green Man, su peculiar directo está empezando a generar interés, teloneando a grupos como Trudy and the Romance. Con sólo tres singles en su carrera, Her’s están demostrando que tienen una facilidad increíble para escribir canciones y tocar en directo. No es fácil ser una banda indie en el Reino Unido y resultar sorprendente hoy en día, pero Her’s lo cosnsiguen con seguridad. Both members, Norway’s Audun Laading and Barrow-born Stephen Fitzpatrick, originate from sleepy coastal towns, but circumstance brought them together in Liverpool where they found they had a mutual connection over odd humour and outsider art. The last six months have taken them on a whirlwind trajectory. ‘Marcel’ follows debut singles ‘Dorothy’ and ‘What Once Was’ which were supported by Radio 1 and clocked just shy of half a million streams between them. After impressing at Kendal Calling and Green Man, their wonderfully peculiar live show is now starting to generate intense interest, and earlier this summer they hightailed it to London to support their Liverpudlian mutant 50’s pop pals Trudy and the Romance at their packed out show at Dalston’s Victoria. Only three singles into their career and Her’s are already proving to have an irresistible knack for songwriting and performing. It’s not easy to be an indie band in the UK and to be exciting nowadays, but Her’s do it with aplomb.